Just behind the iris and pupil lies the lens, which helps focus light on the back of your eye. Most of the eye is filled with a clear gel called the vitreous. Light projects through your pupil and lens to the back of the eye. The inside lining of the eye is covered by special light-sensing cells that are collectively called the retina. It converts light into electrical impulses. Behind the eye, your optic nerve carries these impulses to the brain. 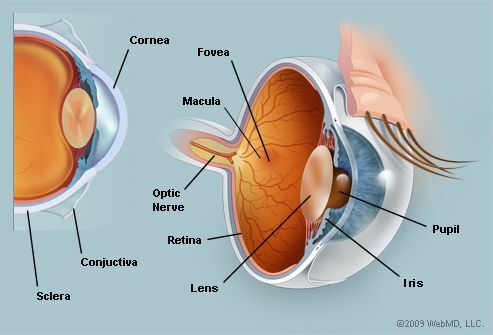 The macula is a small extra-sensitive area in the retina that gives you central vision. Eye color is created by the amount and type of pigment in your iris. Multiple genes inherited from each parent determine a person’s eye color. Age-related macular degeneration: Causes loss of central vision as you get older. Amblyopia: Often called lazy eye, this condition starts in childhood. One eye sees better than the other, so your brain favors that eye. The weaker eye, which may or may not wander, is called the "lazy eye." Astigmatism: A problem with the curve of your cornea. If you have it, your eye can’t focus light onto the retina the way it should. Glasses, contact lenses, or surgery can correct the blurry vision it causes. Black eye: Swelling and discoloration (bruise) around your eye caused by an injury to the face. Blepharitis: Inflammation of your eyelids near the eyelashes. It can make your eyes feel itchy or gritty. Cataract: A clouding of your eye’s internal lens. It can cause blurred vision. Chalazion: An oil-making gland gets blocked and swells into a bump. Conjunctivitis: Also known as pinkeye, it’s an infection or inflammation of the conjunctiva, the clear layer that covers the front of your eye. Allergies, viruses, or a bacterial infection can all cause it. Corneal abrasion: A scratch on the clear part of the front of your eye. Pain, light sensitivity, or a feeling of grit in the eye are the usual symptoms. Diabetic retinopathy: High blood sugar damages blood vessels in the eye. Eventually, they start to leak or overgrow in your retina, threatening your vision. Diplopia (double vision): Seeing double can be caused by many serious conditions. It requires immediate medical attention. Dry eye: Either your eyes don’t produce enough tears, or the tears are of poor quality. Most commonly due to aging but medical problems like lupus, scleroderma, and Sjogren's syndrome can be to blame. Glaucoma: This progressive loss of vision comes from increased pressure inside the eye. Your peripheral vision (side vision) will go first, then your central vision will follow. It can go undetected for years. Hyperopia (farsightedness): You can’t see near objects clearly. It can happen when your eye is “too short” for the lens to focus light the way it should. Distance vision may or may not be blurred too. Hyphema: Bleeding into the front of the eye, between the cornea and the iris. Hyphema is usually caused by trauma. Keratitis: Inflammation or infection of the cornea. It typically occurs after germs get into a scratch on your cornea. Myopia (nearsightedness): You can’t see clearly at a distance. Your eye is “too long” for the lens, so light won’t focus properly on your retina. Optic neuritis: The optic nerve becomes inflamed, usually due to an overactive immune system. The result: Pain and vision loss, typically in one eye. Pterygium: A thickened mass usually on the inner part of your eyeball. It can cover a part of the cornea and lead to vision problems. Retinal detachment: The retina comes loose from the back of your eye. Trauma and diabetes are the most common causes of this problem, which often requires urgent surgical repair. Retinitis: An inflammation or infection of the retina. It may be a long-term genetic condition (retinitis pigmentosa) or come from an infection. Scotoma: A blind or dark spot in your visual field. Strabismus: When the eyes don’t point in the same direction. Your brain may favor one eye. If it happens to a kid, it can decrease vision in the other eye. This condition is called amblyopia. Stye: A red, painful lump on the edge of your eyelid. Bacteria cause it. Uveitis (iritis): The colored part of your eye gets inflamed or infected. An overactive immune system, bacteria, or viruses can cause it. Tonometry: A test that measures pressure in the eye, called intraocular pressure. Your doctor uses it to check for glaucoma. Slit lamp examination: A physician or optometrist shines a vertical slit of light across your eye while looking through a microscope. It can help find many eye problems. Fundoscopic exam: The doctor may give you special eye drops to widen your pupil (he'll call this dilation). Then he or she shines a bright light into the back of the eye so he can see your retina. Refraction: If you have a vision problem, the doctor will place a series of lenses in front of each eye, one at a time, to figure out your prescription for corrective lenses. Visual acuity test: You’ll read a series of ever-smaller letters from across the room. This helps the doctor spot distance vision problems. Reading up-close can help him find problems with near vision. Fluorescein angiography: The doctor injects a fluorescent dye into a vein to take a series of retinal images. Regular adult eye exam: This collection of tests may include the ones mentioned above plus others, like eye movement. Contact lenses and glasses: They correct common eye problems like nearsightedness, farsightedness, and astigmatism. LASIK (laser-assisted in-situ keratomileusis): A doctor creates a thin flap in your cornea and then uses a laser to reshape it. This procedure improves nearsightedness, excessive farsightedness, and astigmatism. Photorefractive keratectomy (PRK): The doctor rubs surface cells off your cornea, then uses a laser to improve nearsightedness, farsightedness, or astigmatism. The cells grow back and your eye heals the same way it would if you'd scratched it. Artificial tears: These eye drops are a lot like your natural tears. They can help treat dry or irritated eyes. Cyclosporine eye drops (Cequa, Restasis): This anti-inflammatory eye drop can treat dry eye caused by inflammation. Laser photocoagulation: A doctor uses a laser on parts of the retina with poor circulation or to treat abnormal blood vessels directly. It’s often used for diabetic retinopathy but can also seal a retinal tear. Cataract surgery: The doctor removes the cloudy cataract and replaces your natural lens with a man-made version. Yanoff, M; Duker, J. Ophthalmology, Mosby, 2008.